4 Commercial Real Estate & Properties in Chinderah are listed in 2 categories. We have 2 Development LandsSale and 2 Industrial Warehouses Sale . Ever wanted to own your own piece of the amazing Tweed riverfront? This stunning 4976 allotment of waterfront land is one of northern NSW best located lots. 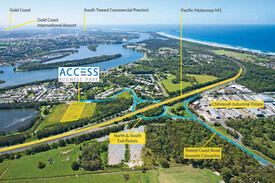 Just 5 minutes drive to the Coolangatta Airport and the Kingscliff CBD, this huge slice of waterfront land would make the ideal location for your dream boating or fishing lifestyle. The site currently features a 2 storey Queenslander style home with 4 bedrooms and 2 bathrooms. Large verandas capture the amazing river views and the well landscaped yard and open space make this front yard one of the best for entertaining. The property also features a double garage/workshop making it ideal to store your boat or caravan. The site is zoned B4 Mixed Use and so could easily be converted to a variety of business or commercial uses subject to council approval. Call Dru today for your inspection!